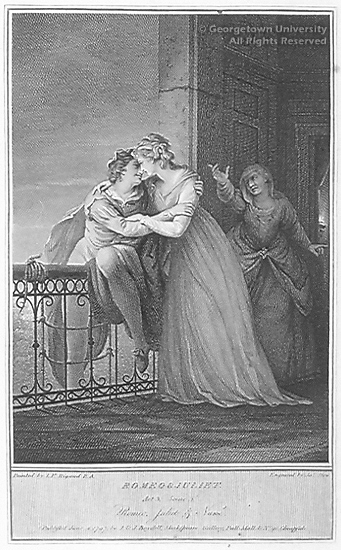 HISTORIES AND TRAGEDIES FROM THE BOYDELL SHAKESPEARE FOLIO presents twenty-five engravings, dating from 1791 to 1803, that were adapted from paintings shown at the Shakespeare Gallery in London in the late eighteenth century. 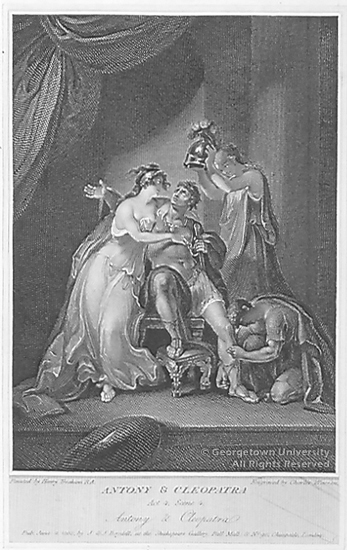 John Boydell (1719 - 1804) was a noted engraver, publisher, print-seller, and even Lord Mayor of London, who established the Shakespeare Gallery and sold to subscribers engravings of the paintings shown there. 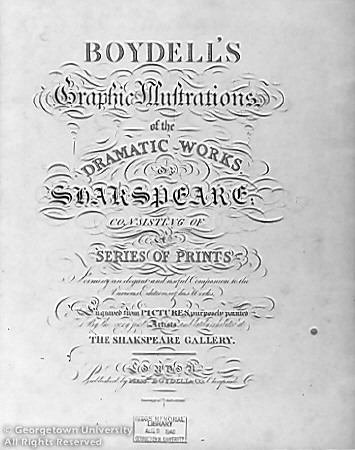 His nephew, Josiah Boydell, published the collected engravings after John Boydell's death. 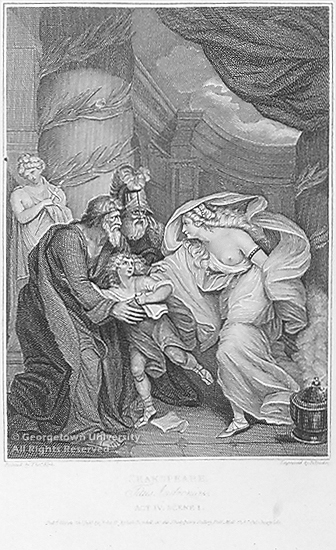 The bound volume of Boydell's Graphic illustrations of the dramatic works of Shakspeare included in this exhibit was a gift in 1940 of Elisha Riggs, Jr., whose father was the first great benefactor of Georgetown University's Riggs Library, in 1890. 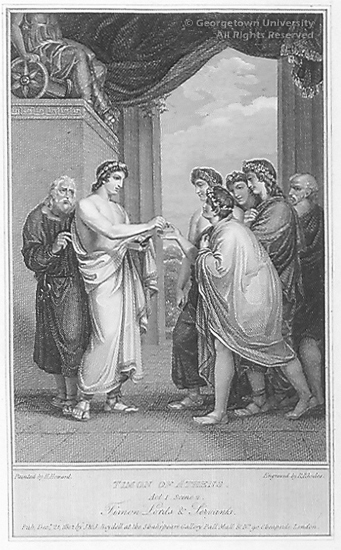 The engravings in the exhibition, which may once have been bound together in a similar volume, came to the Library as a gift of James E. Sale in 1996. 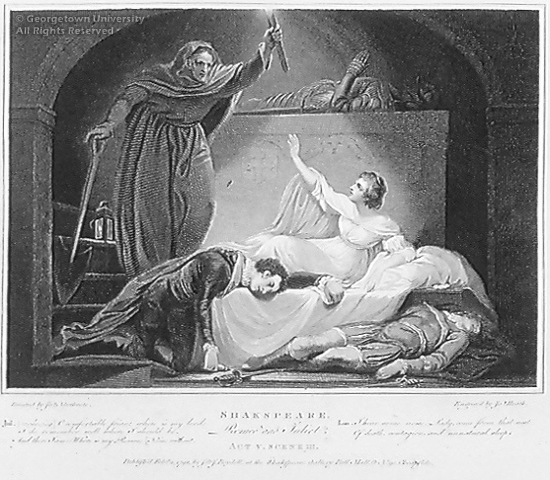 The history of these Shakespearean engravings is the culmination of one man's patriotic vision to promote the progress of the fine arts in eighteenth century Britain. 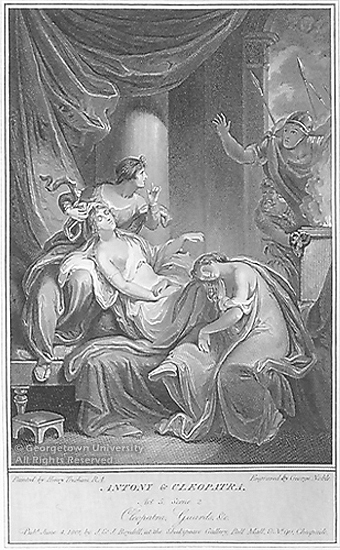 John Boydell, an enterprising and ambitious publisher of fine prints and Alderman of London, succeeded in changing the flow of art trade with the Continent from one of import to export as the demand for British artists soared in the second half of the eighteenth century. 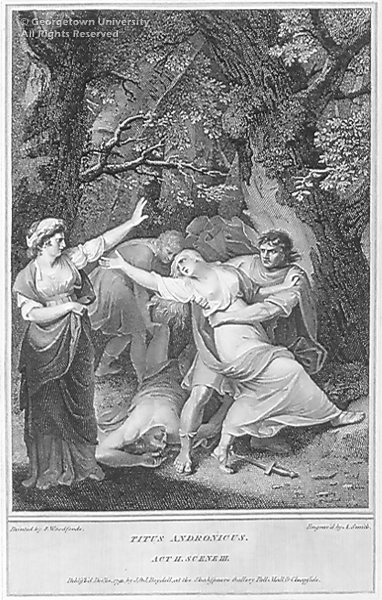 He established his business in the 1740s on the sales of his own engravings, and later, several popular paintings, such as Richard Wilson's Niobe (1760) and Phaeton (1763), which he commissioned and sold as engravings. 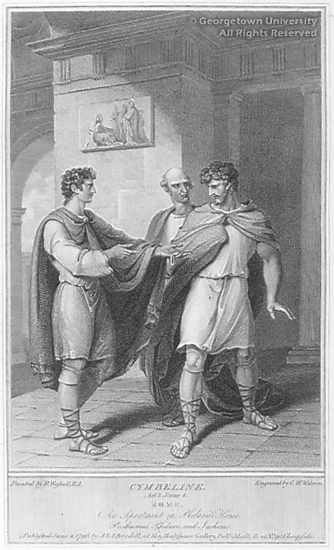 Not content with this achievement alone, and in response to critics from the Continent, Boydell aspired to promote British artists and "establish an English school of historical painting," as he later wrote in his catalogue of The Shakespeare Gallery; for he understood that contemporary artists depended on commissions, and the vast majority of these were dictated by the tastes of the nobility in favor of portraiture and, to a lesser extent, landscape. 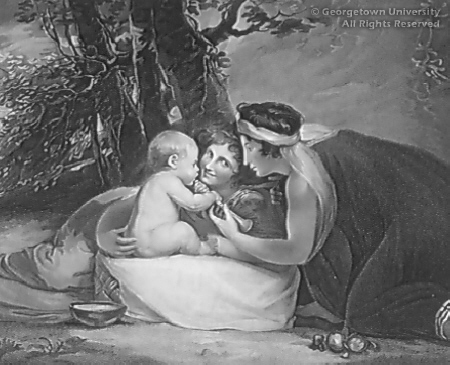 The scheme was hatched at a dinner party in 1786 at the home of Boydell's nephew, Josiah (who continued publishing the engravings after his uncle's death), attended by businessmen and artists such as Benjamin West and George Romney. 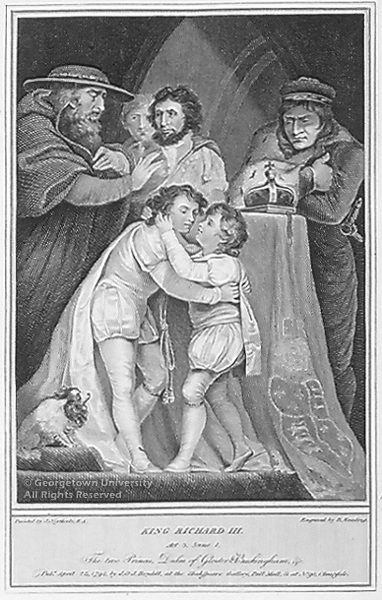 Alderman Boydell declared that "Englishmen wanted nothing but proper encouragement and a proper subject to excel in historical painting," and when it was clear that he would provide this incentive in the form of capital, another member of the group suggested Shakespeare as the most worthy of national subjects.1 With the encouragement of his colleagues, and his considerable revenues from the print trade, Boydell hired the finest painters of his day, including Sir Joshua Reynolds, Henry Fuseli, Angelica Kauffmann, and Benjamin West, to paint the most memorable scenes in Shakespeare's oeuvre. 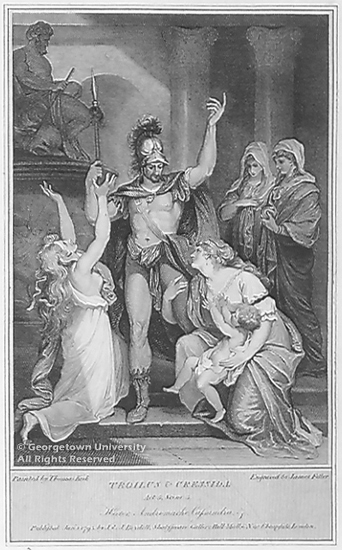 In 1789 he opened his Shakespeare Gallery in Pall Mall with 34 paintings, and produced the first set of engravings in 1791. 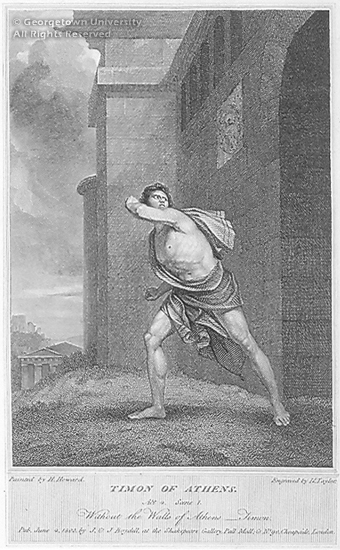 By that time the number of paintings had grown to 65, with the total number of works in 1804 at 170, including three pieces of sculpture. 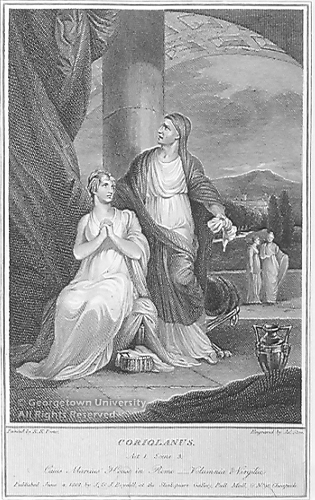 A nine-volume folio edition of Boydell's Shakespeare was published in 1802 and in the next year a two-volume "elephant folio" of all the engravings was produced, the success of which has prompted scholars to compare it with Audubon's Birds of America. 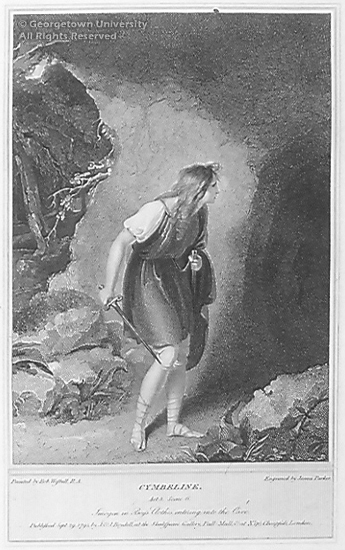 According to the British Dictionary of National Biography (1886), "this was the first great effort of the kind ever made by English artists, and its influence cannot easily be overestimated." 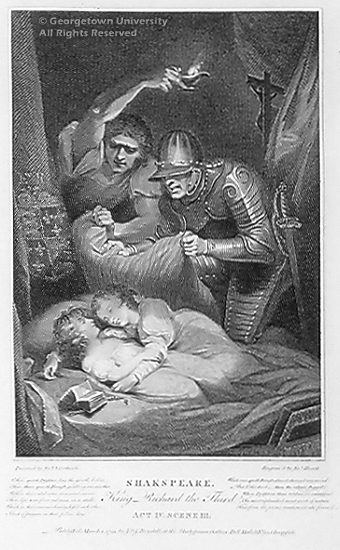 Indeed, Boydell's example was followed in 1799 with Fuseli's exhibition of The Milton Gallery, and an Irish equivalent of the Shakespeare Gallery was conceived by James Woodmason in 1792 and imported to London in 1794. 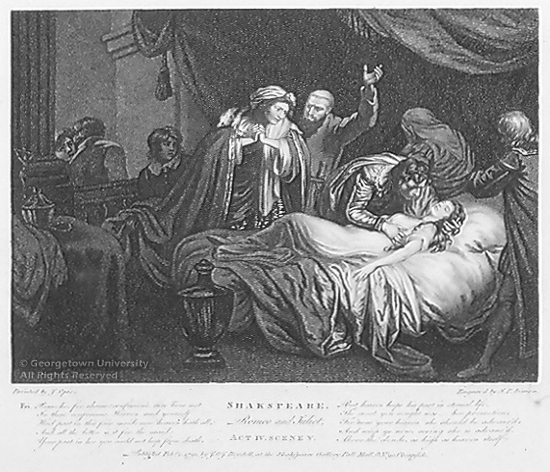 Boydell's popular engravings appeared in subsequent printings of Shakespeare plays and have been adapted and modified for different purposes over the centuries. 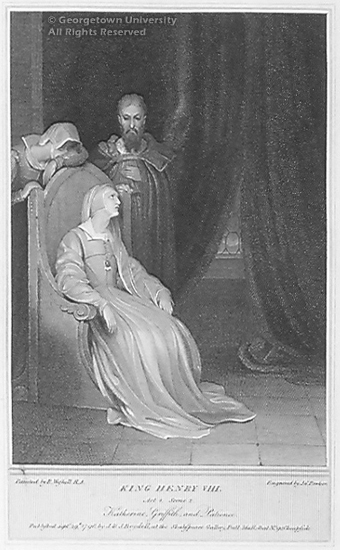 Although Boydell intended to bequeath the Shakespeare Gallery of Paintings to the nation following his death, the intervening French Revolution interrupted his trade with the Continent. To avoid bankruptcy, he was forced to sell the contents of his gallery by lottery. 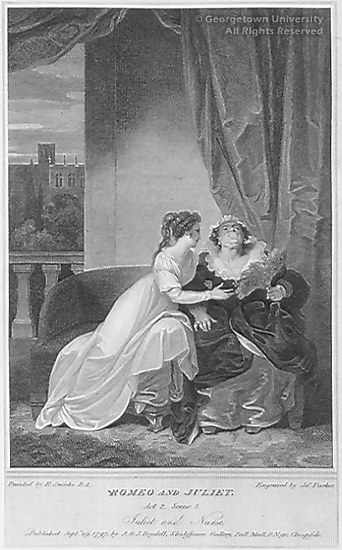 The sale occurred a month after his death in 1804, and most of the paintings have since been lost or destroyed. 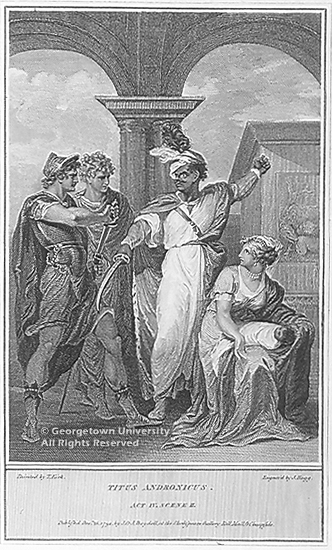 One notable exception is Richard Westall's painting Wolsey resigns the seals, from Act III, Scene 2 of Henry VIII, in the collection of the Folger Shakespeare Library in Washington, D.C.
Boydell's considerable impact on the commerce and culture of his day was recognized in 1790 with his appointment as Lord Mayor of London. 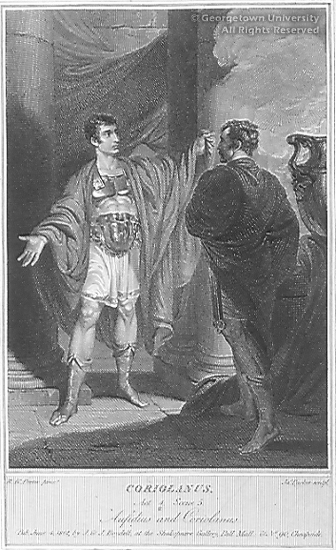 His contribution lives on in the exquisitely executed engravings, conceived as a tribute to his country and countrymen, and as stated in a posthumous advertisement for the folio: "surpass[ing] in splendour, all former publications, as far as the genius of Shakespeare surpasses that of all other Dramatic poets." 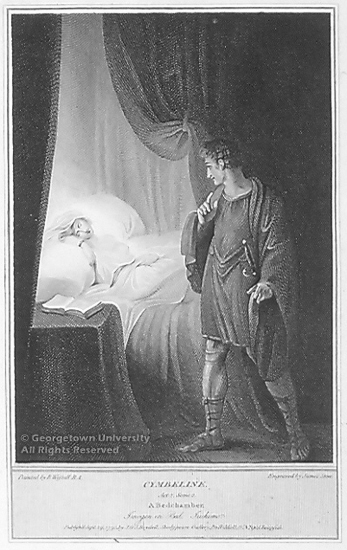 1 Algernon Graves, "A New Light on Alderman Boydell and the Shakespeare Gallery," Magazine of Art 21 (1897): pp. 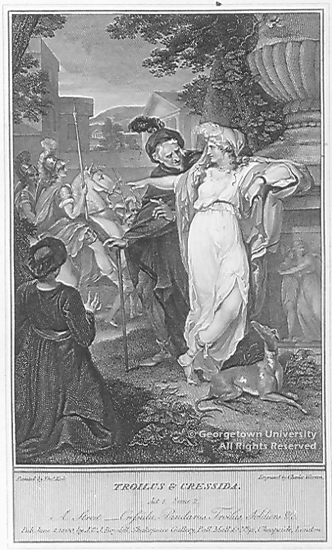 143-44, quoted in Winifred H. Friedman, "Boydell's Shakespeare Gallery" (Ph.D. diss., Harvard University, 1974), 5. 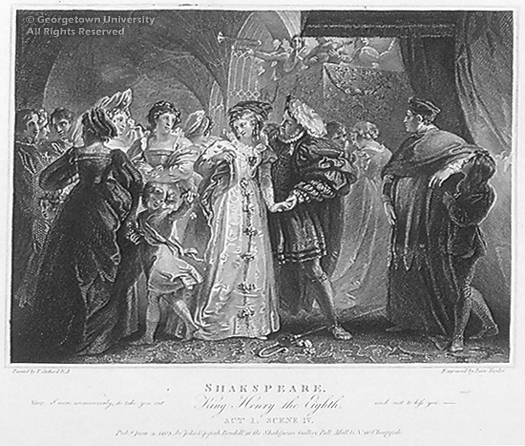 2 Harry Rusche, Shakespeare Illustrated: Boydell's Shakespeare Gallery, (http://www.emory.edu/ENGLISH/classes/Shakespeare_Illustrated/Boydell.html), 19 April 1997 (Accessed 17 May 2004). 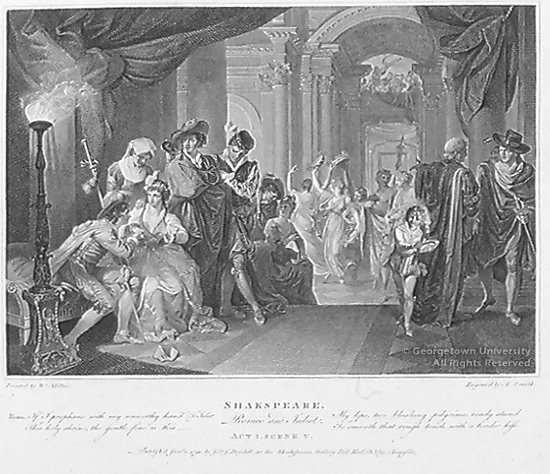 Boydell's Graphic illustrations of the dramatic works of Shakspeare : consisting of a series of prints forming an elegant and useful companion to the various editions of his works, engraved from pictures, purposely painted by the very first artists, and lately exhibited at the Shakspeare Gallery (Cheapside [London] : Messrs. Boydell & Co.; after 1804). Gift of Elisha Riggs, Jr., 1940. 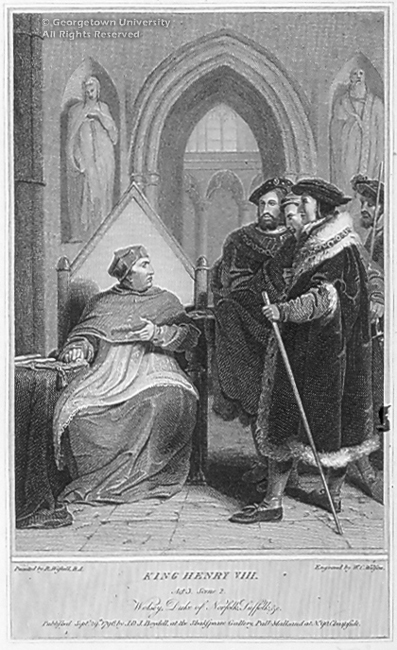 University Librarian Artemis G. Kirk; Associate University Librarian for Special Collections Marty Barringer; Curator Emeritus of Prints The Reverend Joseph A. Haller, S.J. ; Graphic Artist/Photographer David Hagen, of the Gelardin New Media Center; Development Assistant Stephanie S. Hughes; Events Manager Maeve A. O'Connor. The Charles Marvin Fairchild (SFS '48) Memorial Gallery was established in 1997 through the generous donation of Elizabeth (Mrs. Charles Marvin) Fairchild, to provide a permanent exhibit venue for changing selections from the Georgetown University Art Collection's holdings of works on paper and other small objects.